Following the West End opening at the Prince of Wales in 2013, The Book of Mormon has grown into a show of biblical proportions! 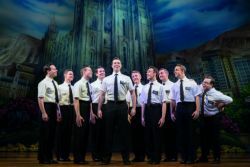 In a show combining Mormons, missions and maggots, a visit to the West End isn’t complete without raucous laughter like you’ll experience watching this show. By the writers who gave us South Park and Avenue Q, it’s an unmissable show that’s won an Olivier Award for best new musical, so it’s looked upon highly by those in the know on London theatre. 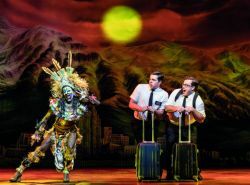 So, if you want to see one of the most popular shows in the West End and be shocked and entertained all at the same time, then The Book of Mormon is the place for you. Feel like a deity as you take your seat in the luxurious Prince of Wales Theatre, right in the heart of Leicester Square. Once the curtain rises, you’ll hear the simple call of “Hello”. But, don’t say hello back because this is the start of the show. 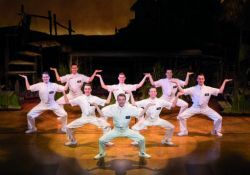 See the Mormons all come together in a hearty rendition of the opening song which greets you into the show’s zaniness. As the Mormons are paired off on their mission, Elder Price dreams of serving in Orlando. But, when he’s called to serve in Uganda with Elder Cunningham, he feels disheartened. As the pair travel to Uganda, it’s clear that both Elders have a lot to learn from each other, especially as nobody in their African surroundings seems receptive to converting to Mormonism. Yet Elder Cunningham’s growing fondness to Nabulungi and Elder Price believing in the Lord God ultimately starts to influence a society to convert in their own special way. 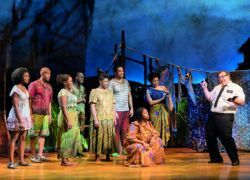 The Book of Mormon manages to skewer religious commentary with pop culture references into a stellar show. 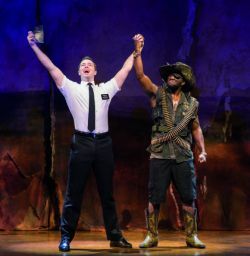 With songs including “Spooky Mormon Hell Dream”, “Baptize Me” and “Joseph Smith American Moses”, you’ll have to make sure you’re not laughing too loud to hear every line. Toeing the line between being offensive and being funny, it’s a fantastic show that is sure to have you thinking about the religion in a totally different way. The West End is being spiritually reawakened with The Book of Mormon and you need to be a part of it. The cast of the show currently includes Dom Simpson as Elder Price alongside J Michael Finley as Elder Cunningham. When the show first opened in the West End, the original cast included Broadway stars Gavin Creel and Jared Gertner as Elder Price and Elder Cunningham. Nabulungi’s name is often changed in the show to reflect popular culture references. Previous names include “Nickelodeon” and “Nutella”.